I have happily received emails and questions lately about the process of my novel writing. In response, I have written a brief page addressing how I determine aspects like the setting, plot, characters, and researching. Visit the “Writing Novels” tab above to learn more about how I write mystery novels. You’re welcome to leave a comment if you want. If you have an additional question that didn’t get answered here, you can also contact me at my email address, via the “Contact” tab. Keep the questions coming, and thank you for your interest. Tell a friend! 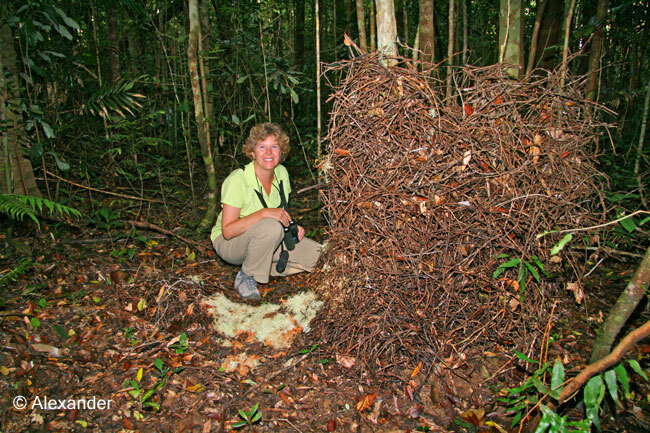 Jet in Australian rainforest with Golden Bowerbird bower, research for Wicked Walkabout. 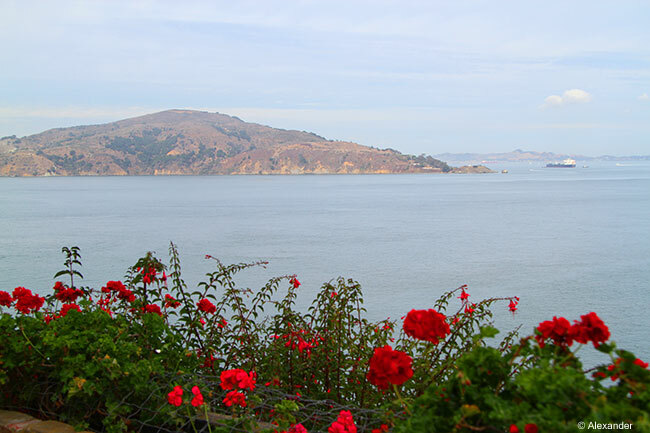 Alcatraz Island is the most visited attraction in San Francisco, entertaining over 1.3 million visitors every year. The Los Angeles Times declared it the seventh most popular landmark in the world (06.16.15). Every day one boat after another leaves Pier 33 loaded with Alcatraz-bound tourists who are curious to visit the famous prison, learn the notorious history. 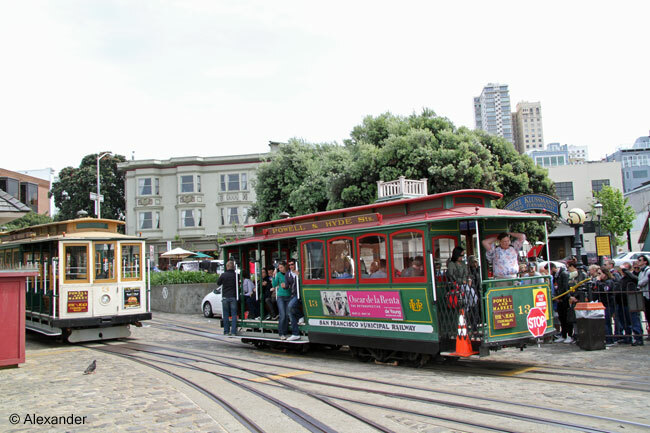 As a San Francisco resident I had already visited here, then returned one day in 2014 to study the setting for a scene in my novel. How Alcatraz began. After gold was discovered in California in 1848, prospectors, businessmen, and families arrived here in droves. It was determined then that the increased value–millions of dollars worth of mined gold–created a need for defense and protection. Read more history, overview here. 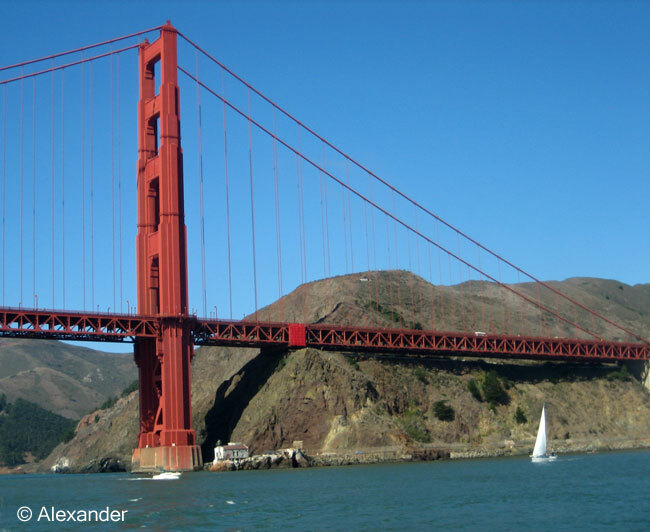 Touring “The Rock” requires reservations and involves a fun ten-minute boat ride on the San Francisco Bay. Visitors take a self-guided tour with audio tapes narrated by prison guards. You can stay at the island all day until the last boat departure, but most people stay a few hours. 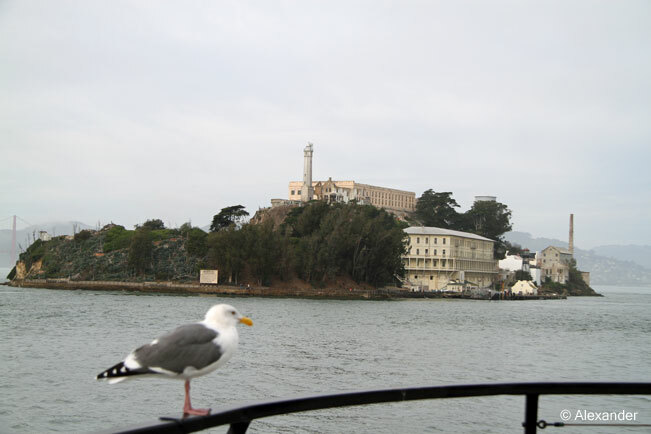 In addition to being a tourist prison island, Alcatraz (the Spanish word for “pelican”) is also a prominent site for nesting birds; and has tide pools, sea mammals and other wildlife, even glowing millipedes. The day we were there we saw Anna’s hummingbirds, a variety of sparrows, plenty of gulls and cormorants. National Park Service nature info here. Glowing millipedes on Alcatraz here. The boat drops you off at the dock, a ranger gives you an overview of the facility and the rules. There’s a steep walk up to the prison, passing by old military gunnery, the water tower and guard towers, other old buildings, and gardens. 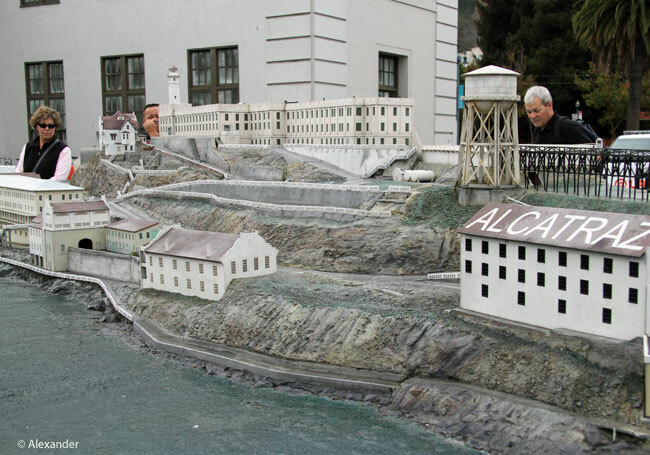 Alcatraz scaled model at Pier 33. Jet (in sunglasses) scoping it out. All the photos here are from that October day when I went to observe and take notes. Golden Gate Graveyard readers will recognize some of these sights from the Alcatraz scene. Once you get up to the cell blocks, you can walk around inside the prison, see where prisoners showered, slept, and ate. Outside you view the warden’s half-burned house, the lighthouse, beautiful views of San Francisco and other sites. 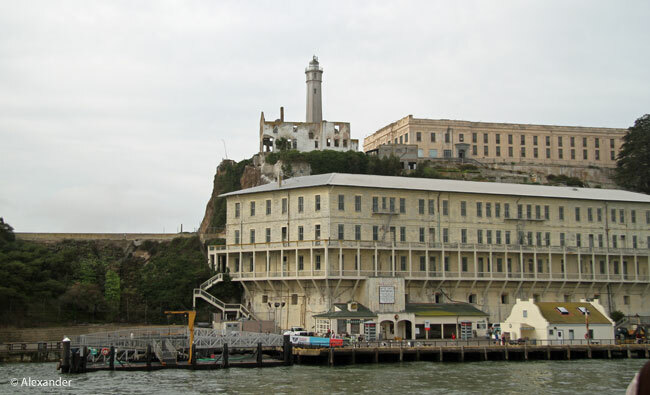 Having written and researched a lot of history about San Francisco for this novel, I find two things especially fascinating: over the years once-serious facilities, like Alcatraz, have turned into frolicking tourist attractions. And how curious it is to witness visitors’ intrigue and animation at this decrepit and defunct old prison. 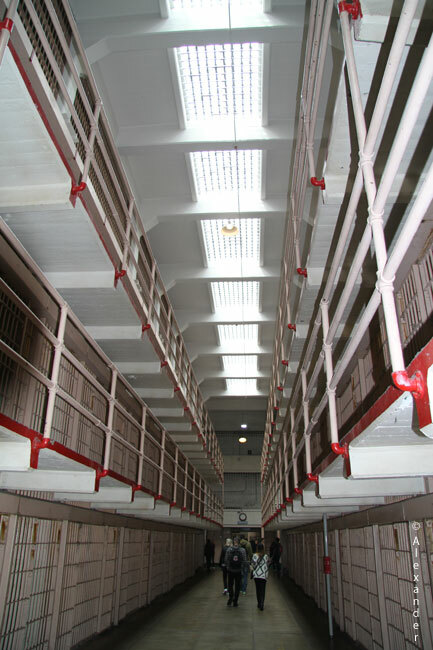 The prison has been extensively featured in books (ahem), films, video games, TV series, and more. A popular new Alcatraz-related attraction is the Escape Alcatraz Drop Ride at the San Francisco Dungeon. It is a stomach-dropping ride simulating an attempted escape. 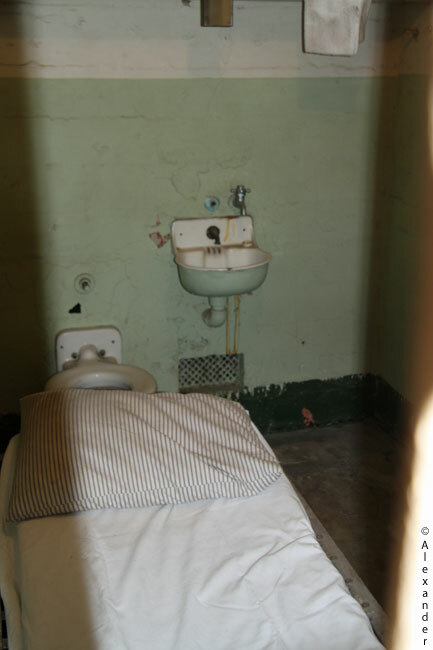 All modern-day Alcatraz folklore stems from the inescapability of this maximum security prison. It was long touted as the place from which no man ever left alive. But is that true? Over 50 years after three prisoners escaped and their bodies were never found, there is still speculation and “Search for the Truth” documentaries. I recently watched a 1979 film starring Clint Eastwood called “Escape from Alcatraz.” It’s pretty good, shows life on The Rock and is based on the actual escape. For an old prison that hasn’t seen a prisoner in over half a century, Alcatraz sure is a lively place. I’m happy it makes for good fiction. If you haven’t bought Golden Gate Graveyard yet, it is available in paperback ($20) or digital format ($6.99). Buy a copy for yourself or a friend…but whatever you do: stay legal. Amazon.com or any other major book retailer. 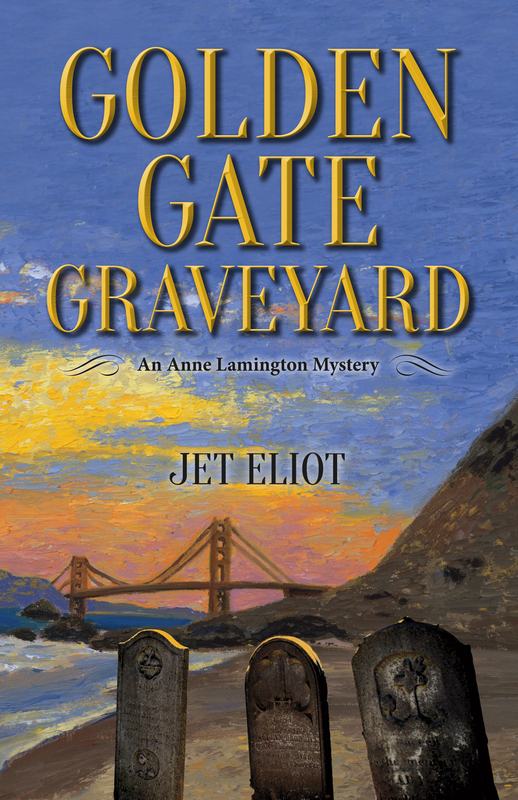 I am pleased to announce my new mystery novel, Golden Gate Graveyard, is now available for your enjoyment. Available in paperback and e-book, below are links for convenient internet purchase. If you prefer to purchase from a bookstore, you can special-order it at your favorite bookstore. E-book also available at Amazon.com. Briefly, I spent the past three years writing and researching this mystery novel set in San Francisco. The plot and characters are entirely fiction, interwoven with some of the city’s history and traditions. Read more here for the book description or go to the Books by Jet Eliot tab above. 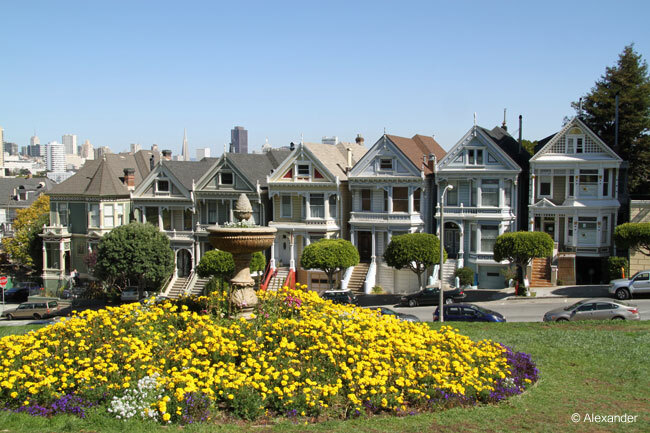 Next week and in the weeks to follow I will be featuring highlights of San Francisco sites as mentioned in the book, here on my blog. 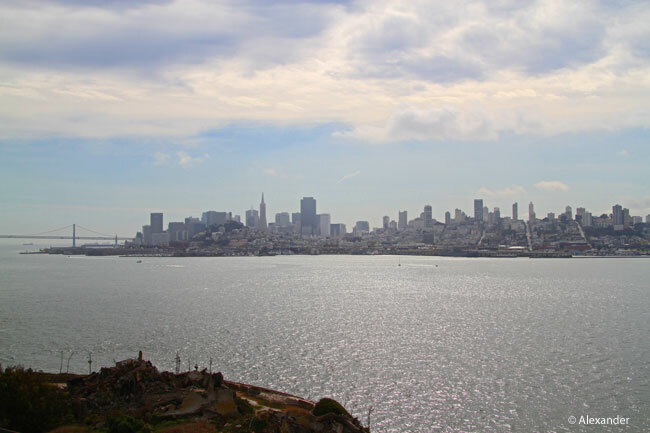 You will not only find posts with iconic San Francisco vistas, but also posts about the writing of the book. So if you have a question about my writing process–the tools I use, how I write, or research, etc.–I am happy to answer your questions. Just shoot me an e-mail via the Contact tab (above) or ask in the comments below. 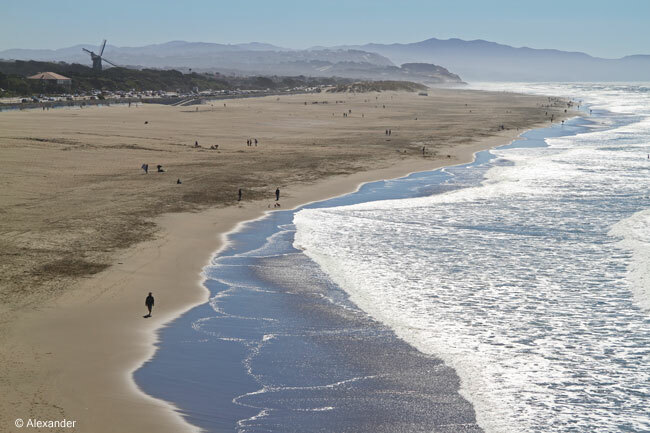 I have spent hundreds of hours in the past three years on San Francisco hills, street corners, and shorelines–taking notes, listening and observing, attending tours and events. 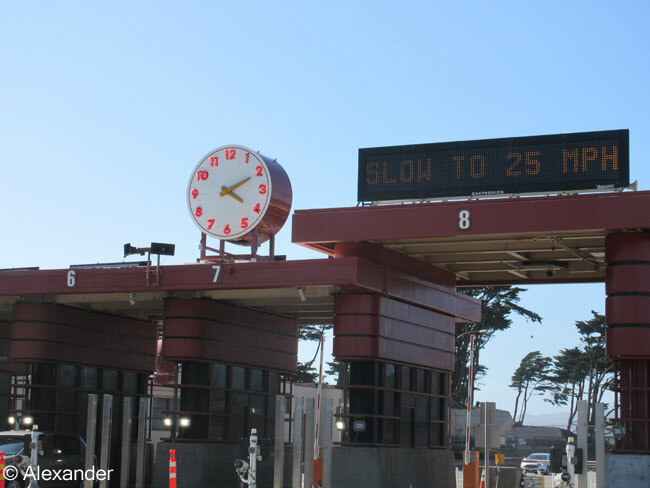 A former San Francisco resident for 13 years and a monthly visitor, I have really enjoyed creating this story and sharing the spirit of this lively and diverse city. Whether you read books or not, with the holidays around the corner surely there is someone you know who would enjoy a good page-turning mystery. It is a joy and honor to share this book with you. I invited fellow author and friend Susan Sternau to be a guest blogger today, to describe a day from her recent trip to Easter Island. 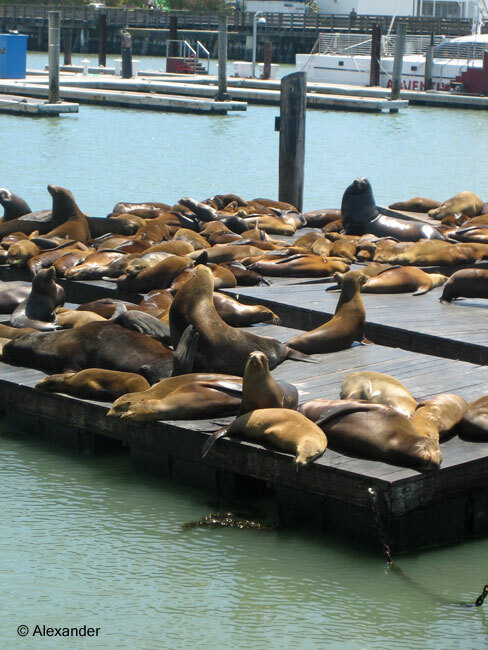 I am pleased to share Susan’s travel adventure below. As background, it is one of the most remote inhabited islands in the world and lies 2,300 miles west of Chile in the South Pacific Ocean. Easter Island, a World Heritage Site, is famous for 887 stone statues, called moai, created by the Polynesians, or Rapa Nui, who lived there. One of my favorite days on Easter Island was visiting Rano Raraku — the quarry on the side of a volcano where all the statues were made. We ate our boxed lunch in a picnic gazebo during a downpour. Then the sun came out and we walked up a path on the side of a volcano dotted with moai statues in all shapes and sizes. The dark volcanic rock of the quarry contrasted beautifully with the smooth green hills. The ocean was nearby, and when we rounded the side of the hill, the restored Tongariki site was visible below. The quarry path curves around one side of a volcanic cone. (The other side of the cone is a steep cliff face). It is incredible to realize that all the statues that we are seeing as heads or partial heads are actually complete figures, some up to thirty feet high. They have been buried over the years in sediments that have washed down the slopes during heavy rains. Recently I saw photos of Thor Heyerdahl’s party standing in their excavations. The men are completely dwarfed by the statues they have uncovered. These are the same figures we are seeing today, but they have been reburied as though those excavations never occurred. There are more than 900 moai on Easter Island and over 300 are still at the quarry. All the carving was done with a hard stone tool called a “toki.” Statues were begun as a long box shape that was literally “blocked” out of the stone. The head and torso were carved facing up to the sky. Eventually the block was undercut and the statue was propped upright so carvers could finish the back. You can see statues in all stages of completion, some still lying on their backs attached to the hill, and many standing upright, still waiting to be moved to their final location on the coast. There is a sense of work interrupted, as though the carvers just took a really long lunch break, but are expected back at any moment. Time has passed, lichen, wind, and rain have smoothed some of the features, but you somehow expect to hear the rhythmic chink of stone against stone resume again shortly. Text and images copyright 2014 by Susan Sternau. All rights reserved. I had an energizing urban adventure last week in Los Angeles. There’s a popular quiz show in America called Jeopardy, and it goes all the way back to 1964. When I was a kid my mother would reward us a penny for every correct answer. In my young adult years I fantasized, like most other viewers, about becoming a contestant. I felt I did pretty good with correct answers. Then more years passed and reality hit. Turns out I’m a writer, and also shy by nature. I like to sit in the back of the room and watch all the stories unfold. Put a moving camera in front of me and I either freeze or giggle. Being a front stage contestant was just not for me. So then I decided to visit the studio and simply watch. And this is what I did last week. I’ve been to studio tapings before and was aware that much of what you see on the television screen is very different from what you see in real life. I prepared myself for the illusion. At the appointed time and date, we stood in line outside in an alley surrounded by giant murals of TV shows; then about 50 or so of us filed into the studio. Inside there were contestants on stage rehearsing with a pseudo-host. They were getting familiar with their signaling devices and answering questions, while production staff and sound engineers bustled around adjusting microphones, cameras, and lights. The game board and other things did indeed look different than on TV, there were illusions; but they were minor. I also saw there was not as much magic as there was hustle. Once we were seated, the announcer Johnny Gilbert told us how important we were to the show. Live clapping is better, he explained, than canned laughter. He made me want to do the best possible job of clapping. His rich voice lifted me in its familiarity, this voice I hear every night but never had a face to place with it. Now I had a face, one of warmth; and his generous time and openness with us transformed me. I stared at him, taking it all in, as he told us what to do. Later, when we could ask questions, I asked him about their volume of fan mail and he gave an articulate and enthusiastic response. 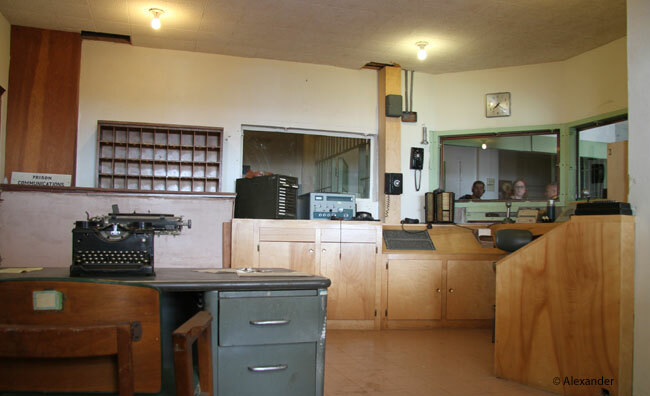 When it was time to go on the air, the countdown started: Five, Four, Three, Two…. As if I was an astronaut about to catapult into space, I was filled to the brim with pure excitement. Pink lights flooded the stage, the theme song I’d known for my entire life blasted the studio. Johnny Gilbert at his lectern shouted out in his booming voice, “This Issss Jeopardy.” I thought I was going to explode. Then Alex Trebek came marching out from behind the stage, initiating another one of the more than 6,500 shows he’s hosted. Oh did I ever clap hard. We all did. I looked around and saw the whole studio audience smiling broadly and clapping heartily. During the commercial breaks Mr. Trebek (how can I address him as Alex?) came over to the audience. He is just as handsome in real life as he is on television, but he’s more entertaining in person. As a TV viewer you pick up on his dry humor and self-deprecating jokes, but until you’re there at the studio, you don’t get to hear all his jokes or witness his theatricals (he tap-danced for an impromptu half-minute). Most importantly, you don’t realize how hard he works and how easy he makes it look. They tape five shows a day. At 7:30 that morning Mr. Trebek gets the material for all five shows of the day. At 61 clues and answers per show, and five shows a day, he facilitates 305 questions a day in front of a television audience of nine million people. He’s done this for 30 years, and so has Johnny Gilbert; but you would never know it from their level of enthusiasm. It’s an array of impressive feats for everyone on and off that stage. We watched one of the judges call up to heaven for a ruling on a question, saw the answer man behind the curtain, watched the director demonstrating to contestants how to flail their arms and project their voices for a future commercial. Was even introduced to the Clue Crew! Everyone has a designated job on this team, and they are all important to the success of the show. As a writer I sit alone at the computer typing and deleting thoughts all day long. No one sees me, yet my office is filled with voices, dances, catastrophes, and murders that all reside within my busy head. Things originate in my head and they blossom out in the world after that. To sit in that studio audience chair at Sony Pictures and see what happens after their writers and researchers have done their work, to actually hear the music and bells, see the colored lights and flashing signs, the waving arms and gestures, and witness the bloopers that will be edited out later…it was all a dream come true. It was also a reminder. We all work away on our day. Sometimes it feels boring, uneventful, even futile at times; we work day in and day out. But it seems to me that just when you need it, we are reminded of how our work fits into the big picture and how important our work, our existence, is. Everything we did from the time we were a kid on the floor in front of the TV up through today…it all matters. And just between you and me: I hope in 30 years I’m as smooth and cool as Alex and Johnny. I am researching East African ethnic groups for my next novel, Sinister Safari. Ethnic groups were once called tribes. It’s a complicated task because people are complicated. In Tanzania alone there are more than 120 different ethnic groups and, as happens with development and globalization, the cultures continue to evolve. There still exist today many groups who have predestined marriages, village elders, medicine men, circumcised women, and education for boys only. But simultaneously there are also Maasai warriors who are saving rather than slaughtering lions, college-educated young adults of both genders, and Africans teaching Africans about AIDS. Regardless of where in the world one travels, there are always people to watch. As it goes in most places in the world, the cities in Africa are more populated and have pockets of modernism. Then the more you travel away from the cities, the less modernized conditions can be. As one who revels in open space and chasing wildlife, I tend to find myself in some of the most remote places in the world. Africa has many remote places that are still habitable and pleasant, which is why it remains one of my favorite places on earth. I thought you would enjoy viewing a few people photos from our travels in Africa. With over 10,000 species of birds in this world, there are many birds to write about. I’m doing a lot of research on Africa right now, so here are photos and fun facts about the exquisite flamingo. It’s one of my favorite birds. There are many aspects of the flamingo that are interesting and memorable, but their sound and group behavior are what thrill me the most. The flamingo can be found all across the world. Here in the United States they are in Florida, Texas and other southern coastal areas. They also live in Central and South America, the Caribbean and Mediterranean; I’ve seen them in the Galapagos Islands, there are even some in parts of Europe. In much bigger flocks they can be seen in India, parts of Asia…and then there’s Africa. I like seeing them in Africa because, well, I love Africa. The alkaline lakes in which they feed produce an abundance of carotenoid pigments that give them an especially rich pink color. This photo was taken in the Rift Valley of East Africa. They flock here in the thousands. I have watched flamingos for hours, and after awhile one might think they’re a bit freaky-looking with the crooked bill, legs longer than its body, and that outrageous bubble-gum color. But they’re not freaky, they’re exotic and lovely. The bill is a work of art. First, it is designed to filter mud and debris from its food with the help of comb-like structures and a rough tongue inside the bill. Second, because the bird wades in shallow waters and has exceptionally long legs, the head is always upside down; so the bill operates in an inverted manner. It is called an arcuate bill because it is bent, and it’s bent so it can scrape the bottom of the lake. The huge flocks are also fascinating. Even when I knew we were on our way to see the flamingoes, I wasn’t sure that’s what I was seeing. We were bumping down the dirt road from miles away, descending into the valley, and there in the distorted-heat-wave distance was a blanket of pink. I thought maybe it was wildflowers. Then as we approached, I saw the lake completely covered with flamingoes. They were all standing wing-to-wing, so close together. Being a very skittish bird, it is difficult to know how close you can get before they’ll disperse, but the guide helps with that. When you get out of the vehicle, quietly, quietly, you hear them. It’s not the honking flamingo sound you hear on You Tube videos filmed in a zoo. It’s an electric sound, a low-pitched buzzing amplified by a thousand. As you watch them longer, feeling that electric buzzing vibrating through you, you notice few are actually standing still. Some are feeding, neck bent down, wading, feeding like methodical lawn mowing. Some are grooming. Others are five, six, sometimes 10 in a line, all moving in unison. And this is the part that I find so unusual: they move in a synchronized line like chorus dancers. They hold their long neck erect and glide around on straight long legs, first one direction, then another; all in perfect harmony. This chorus line moves as other flamingo chorus lines move, each line hurrying in a different direction but no one losing a step or bumping into another. This is courtship. What a grand sight: a lake so big you can barely see the other side, animated by flashy pink dancing flamingoes. It truly is a flamingo fandango.